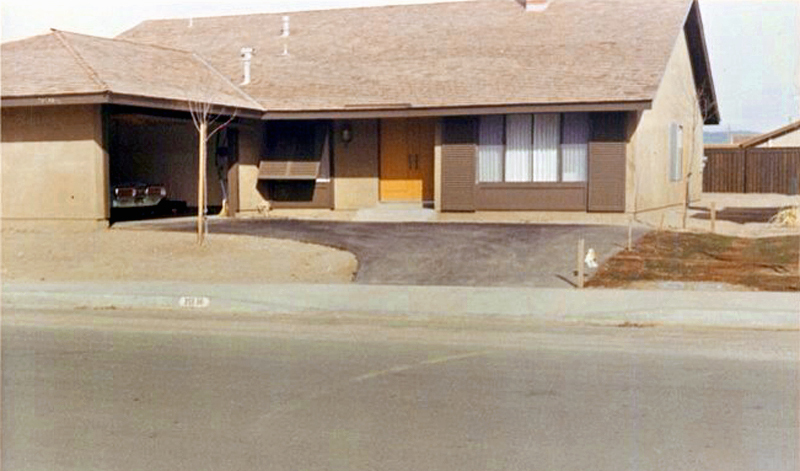 SCVHistory.com HB6701 | Valencia | New Single-Family Home on Avenida Rondel (Old Orchard I), December 1967. December 1967 — One of the first Valencia homes in the first Valencia subdivision (Old Orchard I), at 25136 Avenida Rondel, directly across the street from Old Orchard Elementary School, which opened two years later. All new single-family homes in Valencia came with a young, non-native shade tree in the front yard — and not much else. Buyers had to plant and maintain their own lawns and landscaping in accordance with developer Newhall Land's deed restriction (Codes, Covenants and Restrictions, or CC&Rs). Photo courtesy of Greg Hammermeister, who grew up in this house (b. 3-31-1960; residing in Orlando, Fla., as of 2014). Hb6701: 19200 dpi jpeg from smaller jpeg courtesy of Greg Hammermeister.